Give attention to the details and excellence will come”.Perry Paxton. We might have long forgotten who this Canadian businessman was, but his maxim still holds true. And none more so than in considering detail underfoot. They make the design”.Charles Eames. Charles Eames made these lovely iconic chairs, now collectors’ items, which are recognised as an almost perfect design, simply because he was obsessed with getting the details right. I feel the same about garden details and when faced with a new path, I sniff opportunity! 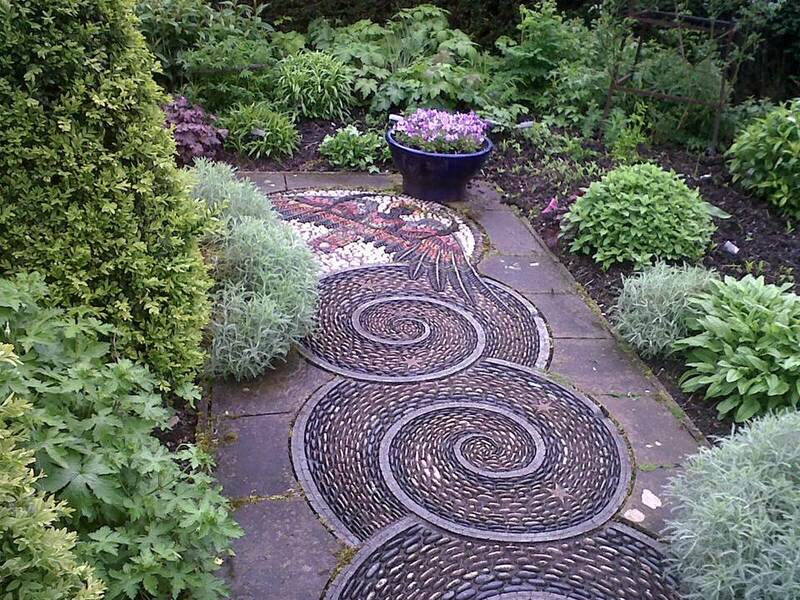 Why put in a plain path, when a few granite sets, stone cobbles or bricks will add a certain edge to it all? I like to put in a bit of detail underfoot every now and again in all of my gardens, as it has the effect of slowing you down so that you can take it all in. It’s the equivalent of a comma or semicolon in a sentence – a breathing space, before continuing on. The simplest way of adding detail to paths is to line the edges of the your Indian stone with cobbles, frost proof bricks or stones sets. One of my favourite devices is to use crosshatching with small setts in a contrasting colour (black setts look good with York stone paving) which, whilst they are certainly fussier and more expensive to lay,are also extremely decorative and eye-catching. Even taking out a few slabs and laying cobbles or setts in mortar can break up a boring patio and make a difference by adding much-needed variation in texture. This is underneath a pergola – I wanted the visitor to slow down and smell the roses dripping from it, so I changed the paving detail, using slate and brick in a diamond pattern. A complete contrast to the York stone areas beyond.